I was a bit worried when the Fedex driver dropped the amplifier on his way to my front porch, but Rogers’ sturdy packing prevented any damage. To assure plenty of ventilation, I placed the EHF-100 Mk2 on the top shelf of my shorter equipment rack, displacing the laptop-computer server, which normally resides there. I connected the Clarity Cables Organic speaker cables I usually use. For the input, I first used an unidentified 3.5mm-to-RCA cable that was included with a portable USB DAC I had reviewed. I employed that cable because I was using Meridian’s Explorer2 DAC to play the few MQA-encoded files I have collected. Later, I used Clarity Cables Organic unbalanced cables from my PS Audio DirectStream DAC. I also plugged my FM tuner into another rear input using Crystal Cable’s Piccolo interconnect cables. Since Rogers sent me one of its Quiet Cable power cords, I used that for the power input straight into the wall. The Quiet Cable was rather stiff, but didn’t have any problem flexing to go into the wall or the rear of the amplifier. It has impressive carbon-fiber Furutech AC and IEC plugs, which helps explain its cost. I normally use a separate powered subwoofer, but since the EHF-100 Mk2 had no line-level output, and my subwoofer has no speaker-level inputs, I had to forego the sub. I disconnect the subwoofer anyway when evaluating an amplifier’s bass performance. I loved the printed user manual, which was clearly written in a large font—much appreciated by us aging audiophiles. Two spare fuses were included. The manual included a section on the theory of operation for the amplifier, which describes the circuit used, and a section for care and maintenance. In addition to the manual, there was a very thorough list of measurements for the specific amplifier being reviewed. Very cool. The hefty Rogers optional remote control operated very smoothly. The action of the remote volume control was gradual, so I had fairly fine control over the playback level. I like that. Some remotes have two volume settings: too loud and too soft. After inserting the tubes and attaching the cables, I turned on the power switch, let the tubes warm up for 30 seconds, then turned on the operate switch. Both switches lighted up when turned on, and the music started as soon as the operate switch was thrown. The manual states that the operate switch can be used as a pause or standby switch for a short period. There was a slight hum after the power switch was turned on, which went away when the operate switch was turned on. 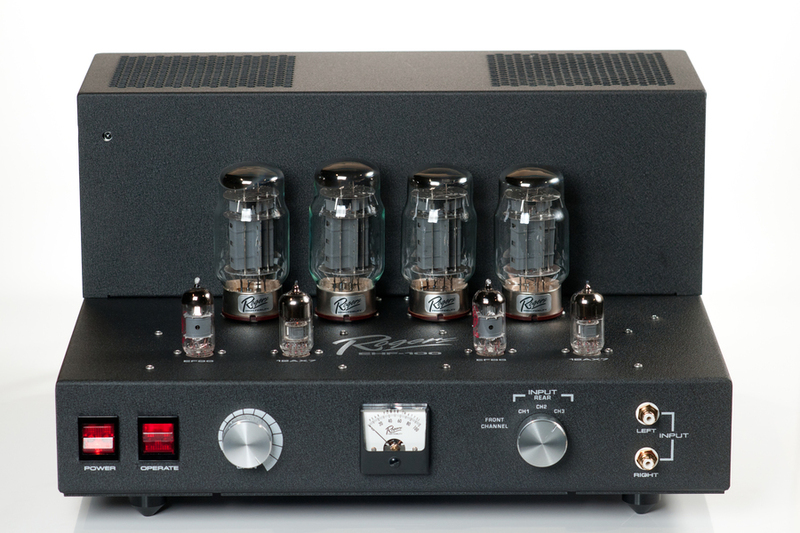 Class A amplifiers run rather hot, and tube amplifiers run fairly hot, so a Class A tube amplifier can run very hot. The EHF-100 Mk2 certainly does, although I have used several amplifiers that ran even hotter. Both the amplifier and power cord were already broken in, but I played them for several days after installing them, getting used to the sound while I cycled through a variety of music—some old, some new, some high-resolution downloads, lots of Red Book rips. This is the fun part of being a reviewer. The front meter was calibrated in watts, but driving my sensitive horn speakers, the needle sometimes seemed to be stuck or broken (it wasn’t). Even when I cranked the volume up uncomfortably high, it showed a maximum output of 3–4 watts.